Who doesn't love Hello Kitty? 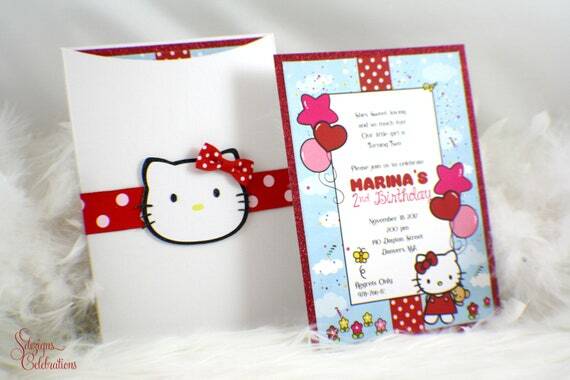 This is a super cute invitation that will be perfect for a little girl who loves Kitty :) It's a lux invitation with handcrafted details of Hello Kitty's face on the front of the jacket and features a real fabric bow. Invitation printed on matte cardstock with a sparkly red back layer. *Stamps for RSVP envelopes, current post office price $.50 cents. This is just a sample. Like all of our designs, this is totally customizable to your choice of color, ribbon and a variety of fonts are also available. *To get a physical sample, not customized, just to see the materials, please choose option "Sample "As is" when purchasing this listing and there is no need to send in any other instructions or wording. *A proof will be emailed to you within 72 hours of receiving your personalized information when we are not on high demand, it may take a day or two more if we are. If you are starting your full order, we will also send you the remainder invoice. Once the payment and approval of proof is in, we will go into production. Please ask us what the turn around time will be on your order so we can be specific. You can also refer to our policies section for basic turn around times.